Sonic Advance (prototype) is a prototype of Sonic Advance that was dumped by Orengefox and released October 15th of 2011. It was acquired from an ex-Sega dev. The ROM itself appears to be near identical to the US release of Sonic Advance with the major exception of an altered header and only a handful of altered bytes. The game freezes in certain areas of some levels (Secret Base Zone, Casino Paradise Zone). Spinning Tubes either don't function properly or don't work at all (Secret Base Zone, Casino Paradise Zone, Egg Rocket Zone, Cosmic Angel Zone). The save file contains a partially raised Chao name Dooogy within the Tiny Chao Garden. The prototype cart has a complete save file (all emeralds acquired/all levels accessible for every character). The save file appears to be slightly different to the more common emulator saves having various portions of the file humorously marked "GBASUX." 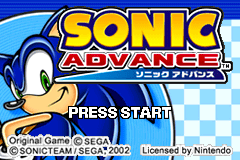 The Header of the Sonic Advance prototype is SONICADVANCEASOE8P. The E of ASOE is the US region code, while 8P is the company code for SEGA. The US final release of Sonic Advance has a header of SONICADVANCEASOE78, featuring THQ's company code of 78. The only header to feature SEGA's 8P company code is the Japanese release, with the European release using 6W, another company code associated with SEGA. Seeing as this is a near final, US region coded prototype using a SEGA company code, it is safe to assume that THQ took up its role as US publisher late in the release process. This page was last edited on 10 April 2018, at 13:55.